group sites) must be reserved through Discover Camping. No camping at this park. An area of large, undisturbed, floodplain islands in the North Thompson River, containing braided channels, sand-bars and river-bank. Note that no camping or day-use facilities are provided here. This park protects large undisturbed islands, associated braided channels and sand bars, including river bank in the North Thompson River Floodplain. Access to this park is only by boat or canoe. 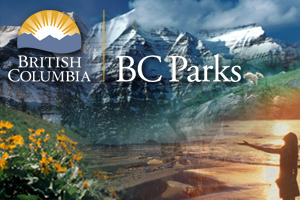 85 km north of Kamloops on Hwy #5; the Park is located adjacent to Hwy #5, in the North Thompson River; access by boat only. History – Established April 30, 1996. Cultural Heritage – Remnants of Hudson Bay Company trail nearby on east side of North Thompson River. Conservation – Contains cottonwood, hybrid spruce, willow, red ozier dogwood, black twinberry, hazelnut, carex. Wildlife – Fish species in the North Thompson River include rainbow trout, salmon, dolly varden. A canoe or kayak would be necessary to access the North Thompson River in this area. Always exercise caution when navigating the North Thompson River. Sweepers and log jams may not always be visible in advance. Excellent opportunities to view songbirds and waterfowl. Snowshoeing is permitted in this park; however, there are no designated trails.